Our second day of the Cultural Triangle tour in Sri Lanka, we started off early. Kimi and Trevor were good sports about it, and we all appreciated the early start to beat the heat. Our first activity was to hike Sigiriya rock before it got too hot and crowded. We arrived around 8 am, which ended up being fine; the morning sun is blocked by Sigiriya Rock when you climb up the west side. The park opens normally at 7 am, but during peak season they open as early as 6:30. We also were unaware that it was a school holiday. On our way down, we battled against crowds of uniformed school children heading up the rock. Be sure to bring lots of water and be prepared for stairs – 1,200 of them! Sigiriya is a monolith, not unlike Uluru in Australia’s outback. The area around Sigiriya was first established with Buddhist monasteries. In 477 CE, Kashyapa I, the son of the king and a non-royal concubine, seized the throne. His brother and rightful heir to the throne, Moggallana, fled to India. Kashyapa moved the capital from Anuradhapura to Sigiriya and built his fortress up on top of the rock. Kashyapa ruled for 22 years before his brother returned with an army to retake his kingdom. The capital was moved back to Anuradhapura and the fortress at Sigiriya became a monastery. We enjoyed the hike up Sigiriya and the history, but if you are looking for a second great hike to do, a cheaper one, or just a better view of Sigiriya as a whole, check out the nearby Pidurangala Rock. Pidurangala Rock as viewed from Sigiriya. You don’t have to hire a guide to tour Sigiriya but we are glad we did. He hiked with us all the way up to the top! Our guide, Sisi, told us all kinds of interesting facts that were not available otherwise. For example, he told us that it is suspected that the king had 500 wives! Once we crossed over the inner moat, the grounds around the rock were gardens with pools and fountains. Sigiriya is an excellent example of ancient urban planning. The layout is on an axis, stretching from Sigiriya Rock out west. It reminded me a lot of the view of Canberra looking down from Mount Ainslie. Sisi told us that the fountains still work in the rainy season. The inner moat of Sigiriya. Fountains during the dry season. Our guide told us all about the gardens we were going through and the rocks we were passing. Instead of taking the main route, we came up the side, which is marked on the brochure’s map. This route took us by several caves, including the cobra-hood cave, and a deep cistern carved straight down into a rock. Once you reach the base of Sigiriya, there is a spiral staircase up to the frescos. Frescos of partially naked women adorn the western side. It’s easy to see why it could have a reputation as the king’s pleasure palace. Pictures are not allowed. Next is the Mirror. This wall was highly polished plaster, so shiny it was like a mirror. The plaster is made of beeswax, termite The king could walk through with one of his 500 ladies and admire the view! Also, the mirror became popular for ancient graffiti; sometimes poetry, sometimes just “so and so was here”. You can still see a few lines of Sanskrit poetry on the wall. After the mirror was a small courtyard, and Sisi pointed out a very large boulder set on the slope. 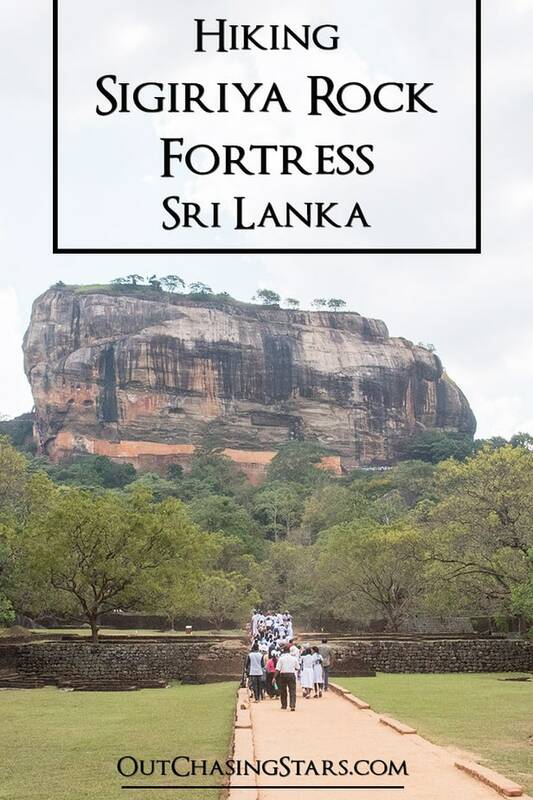 The boulder is propped up with supports and is a defense mechanism – if Sigiriya were to come under attack, the supports could be removed and the giant boulder would slide down and rush the invaders. About halfway up the rock is the Lion Gate. The head is long gone, but the paws of the lion stand watch on either side of the stairs. As you can see, even with our early start it was pretty crowded. Finally, we reached the top, after a supposed 1,200 stairs. All that remains of the fortress ok the top of Sigiriya is the foundations. Sisi described to us the rooms; throne room, King’s bedroom, dancehall, etc. The view is spectacular. The view of the garden layout from the top of Sigiriya. The Buddha at Sigiriya Temple. Can you imagine what this must have been like with the king’s full retinue? Trevor hanging out by the pool. The area around the Lion Gate is full of toque macaques. I think it looks like he’s wearing a toupee and heavy eye makeup. A midlife crisis grunge rocker, maybe? Toad hanging out at the cistern. Grizzled Giant Squirrel. Our guide fed the squirrel. Back down we went, passing quickly through the parts we’ve already seen and to the museum. The Sigiriya Museum holds some artifacts from archeological digs and some timeline information about the kings and whatnot. Also, they have a computer-generated video of what the fortress at the top probably looked like. It was worth the stop in. Subscribe to hear more about our adventures in the Cultural Triangle of Sri Lanka!